A drunken shipwreck angers God and King. A sad disaster happened which caused much lamentation and innumerable tears to flow. Thomas, the son of Stephen, had obtained an audience with King Henry I, and offering him a gold mark, said to him, “Stephen, the son of Airard, was my father, and during his whole life he was in the service of your father [William the Conqueror]. It was he who conveyed your father to England in his own ship, when he crossed the sea to make war on Harold. The mariners were in great glee at hearing this, and greeting the king’s son with fair words asked him to give them something to drink. The prince gave orders that they should have three measures. No sooner was the wine delivered to them than they had a great drinking bout and, pledging their comrades in full cups, indulged too much and became intoxicated. By the king’s command, many barons with their sons embarked in the White Ship, and there were in all, as far as I can learn, three hundred souls on board the ill-fated ship. But two monks of Tyron, Count Stephen and two of his men-at-arms, William de Roumare, Rabel the chamberlain, Edward of Salisbury, and several others came ashore, having left the vessel upon observing that it was overcrowded with riotous and headstrong youths. The crew consisted of fifty experienced rowers, besides an armed marine force, who were very disorderly, and as soon as they got on board insolently took possession of the benches of the rowers, and being very drunk forgot their station and scarcely paid respect to anyone. Alas! How many among the company embarked were without the slightest feeling of devotion toward God, “who rules the storm and calms the raging sea.” They even drove away with contempt, amid shouts of laughter, the priests who came to bless them, with the other ministers who carried the holy water; but they were speedily punished for their mockery. Besides the king’s treasure and some casks of wine, there was no cargo in Thomas’ ship, which was full of passengers, and they urged him to use his utmost endeavors to overtake the royal fleet which was already plowing the waves. In his drunken folly, Thomas, confident in his seamanship and the skill of his crew, rashly boasted that he would soon leave behind him all the ships that had started before them. At last, he gave the signal for departure; the sailors seized the oars without a moment’s delay, and, unconscious of the fate which was imminently impending, joyously handled the ropes and sails, and made the ship rush through the water at a great rate. But as the drunken rowers exerted themselves to the utmost in pulling the oars, and the luckless pilot steered at random and got the ship out of its due course, the starboard bow of the White Ship struck violently on a huge rock, which is left dry, every day, when the tide is out, and covered by the waves at high water. Two planks having been shattered by the crash, the ship—alas!—filled and went down. At this fearful moment, the passengers and crew raised cries of distress, but their mouths were soon stopped by the swelling waves, and all perished together, except two who seized hold of the yard from which the sail was set. They hung on to it the greater part of the night in earnest hope that they would receive aid in some shape or other. 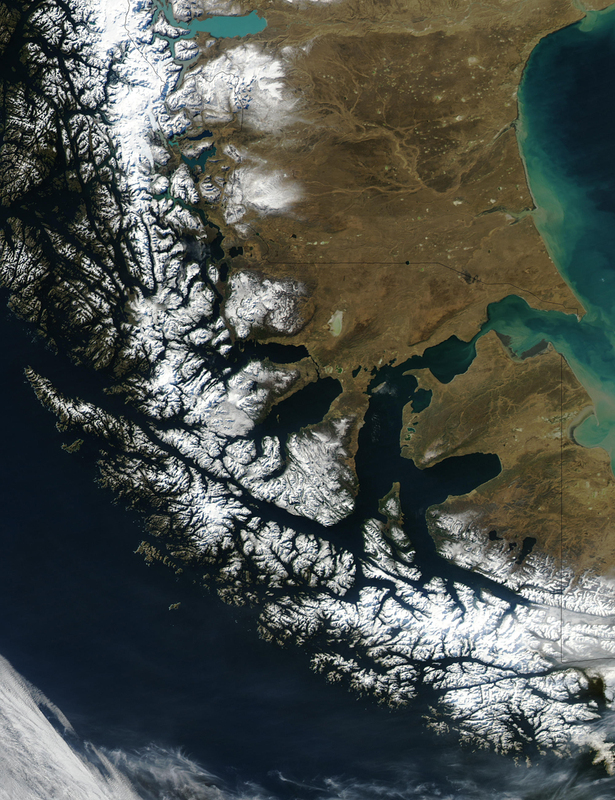 Strait of Magellan from space, 2003. © Jacques Descloitres, MODIS Rapid Response Team, NASA/GSFC. The moon was at this time in her nineteenth day in the constellation of the Bull, and gave light to the world for nine hours, so that all objects on the surface of the sea were visible to the sailors. Thomas, the master of this vessel, after his first plunge into the sea, gained fresh energy and, recovering his senses, raised his head above the water and, perceiving the two men clinging to the yardarm, cried out, “What has become of the king’s son?” The shipwrecked men replied that he and all who were with him had perished. “Then,” said Thomas, “it is misery for me to live any longer.” Having said this, he abandoned himself to his fate in utter despair, preferring to meet it at once, rather than face the rage of the king in his indignation for the loss of his children, or drag out his existence and expiate his crime in a dungeon.